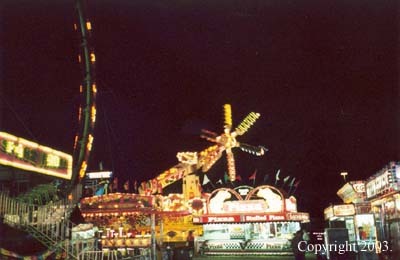 The Top Scan, owned by Cumberland Valley Shows, is the only traveling version of the ride in the United States. It can be found at three other parks in the country, but none runs theirs as well as C.V.S. does (although Long Island Adventureland comes close). The Top Scan, called the Space Roller by the show, re-defined the "Super Spectacular" in the United States. 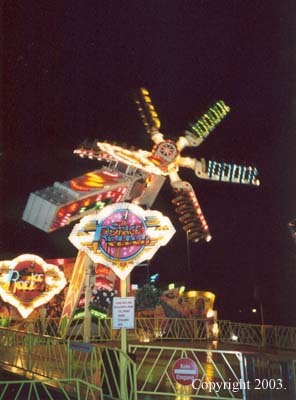 The machine is a staple on European midways but the American fair-goer was not sure what to expect when they first saw the Top Scan thrill riders. The ride, manufactured by Mondial Rides, racks up onto four trailers. 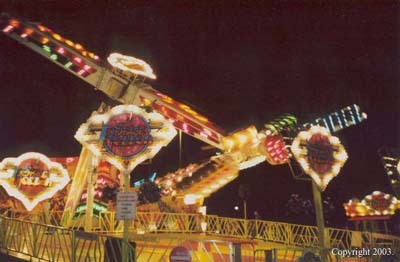 It has six arms that hold five riders each. 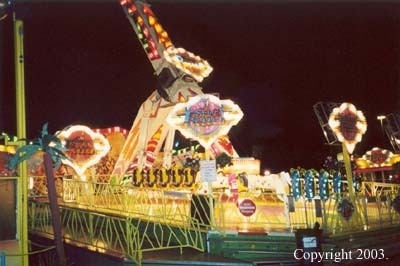 The power of this ride embarrasses most American one-trailer rides as the large, counterweighted boom raises the heavy load with ease. The Space Roller came from Germany, as is evidenced by the "Kein Eingang" (No Entry) sign on the gate in the foreground. The ride has a nicer flash package than many rides on American midways.